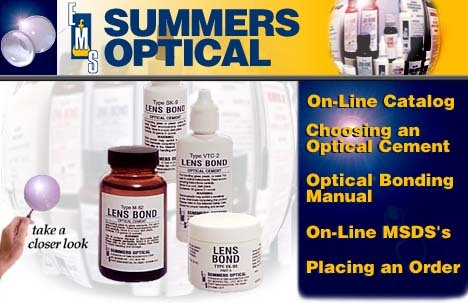 For forty years, Summers Optical has manufactured and distributed optical cements and adhesives for military, commercial, and aerospace usage. Formerly known as Summers Laboratories, we have been the innovators of unique adhesive systems for the bonding of glass to metal, glass to glass, metal to plastic, and plastic to metal as well as 2-Component and 1-component (UV curing) cements for the bonding of like and unlike substrates. All of our cements and adhesives have been formulated and are manufactured keeping in mind many of the typical bonding problems that are prevalent in the optical industry. Our line of cements offer solutions to broad band transmission, high mechanical shock and chemical resistance, differences in thermal expansion, laser, fiber optic, and filter applications, as well as bonding a wide variety of substrate materials. We have always been committed to our customers and this commitment is matched only by our pride in quality and workmanship. You are invited to browse through our home page to learn more about our cements and our cementing accessories and what we have to offer the optical industry. Summers Optical, A Division Of EMS Acquisition Corp.